Bali Governor present the results of a survey conducted to foreign tourists while in Bali. The survey will be undertaken concerning many things about the complaints of foreign tourists while in Bali. There are eleven of the most complained about foreign tourists while in Bali. The results of the survey conveyed by the Governor of Bali in Bali Podium Free Talk Anything in the Lapangan Bajra Sandhi Denpasar, Sunday, February 8th, 2015. It is inevitable that Bali is an island packed with garbage. Garbage thrown carelessly by residents. Waste management system is also very bad. Garbage just piled in landfills. There is no good treatment for all trash in Bali. Kuta Beach is a beach that is very famous and a gathering place for people from various countries, the rainy season is always filled with garbage. Kuta Beach becomes very ugly, disgusting during the rainy season, because the garbage piled sealalu and stranded on this beach. With this condition, of course, all tourists visiting Kuta Beach certainly complain. Because merica see beautiful beaches, suddenly filled with garbage. Certainly they were very disappointed with it. Traffic congestion is the most complained about by foreign tourists during a visit in Bali. Dipungkuri difficult. Roads in Bali never grow. Mass transportation is also very minimal, so there is no alternative that can be used to smooth transportation. Almost all roads in Bali are always traffic jams. Starting from east to west, north to south, all the inevitable traffic jams. Factor of traffic congestion in Bali is Bali's economy level residents are getting better and increasing. Everyone had a vehicle, at least every citizen of Bali have one motorcycle for traveling. 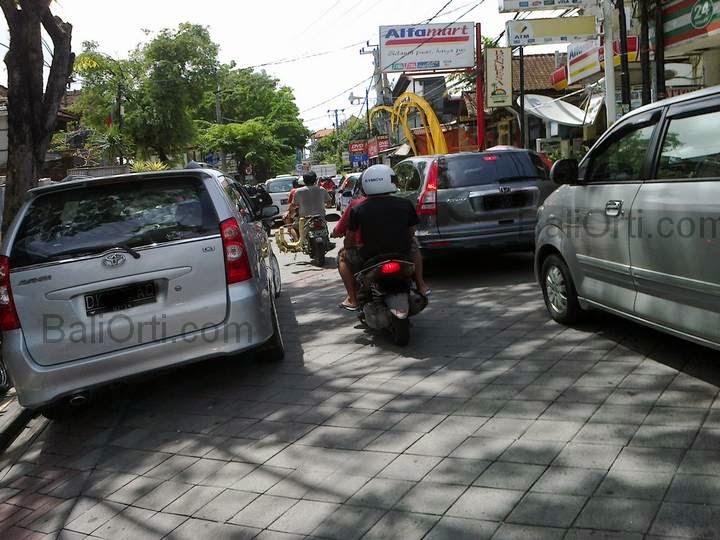 Motorcycles and cars are vehicles mandatory for everyone in Bali. Because there is no good mass transport in Bali. Bali governor appealed to all parties to make changes and improvements to the bad things that exist in Bali foreign tourist-related discomfort while in Bali. He is determined to be a green island of Bali, the island is free of organic foods made from toxic chemicals. The recent survey done in Bali concluded that garbage and traffic were at the top of visitors complaints. Next came Immigration and customs at the Bali airport, and last came dishonest money changers. I'd like to suggest Bali Orti look into the practice of cheating tourists when they change money here. This is often done the first or second day of their arrival in Bali. If they are unfortunate enough to pick one the dishonest changers and find they've been cheated out of tens if not hundreds of dollars, imagine how this will not only upset and ruin their holiday in Bali, but also how that takes away purchases from Taxi drivers, art shops, warungs, etc. The tourist is likely to change their perception of Bali and the Balinese and possibly not come here again. Why are these unlicensed and illegal money changers allowed to continue cheating tourists and ruining their holidays, as well as the reputation of Bali? Back to the Airport. Since relocating after the renovation, the official taxi counter discontinued posting their rates to local destinations. At that time, many complaints were heard regarding the taxi counter staff over charging tourists. Recently, an Indonesian friend was told the rate for a taxi to Hotel Amaris on Padma Utara in Legian would cost him 200,000Rp. That's double what the real prices is. Since there is no price list posted and available for tourists to see, it's easy for counter staff and their many friends behind the counter to cheat local and foreign tourists. The Supervisor of the Airport Taxis was called but he didn't seem to care about our complaints. Is this what Bali wants tourist's first encounter with the Balinese to be? Cheated?